Not Meat Free St. Patrick’s Day Monday | I Am Not A Restaurant! The great common denominator connecting Jewish and Irish tables is celebrated today. You can start days earlier, or you can buy your brisket with a seasoning pack and make life easy and delicious. At just under two pounds this piece of deliciousness is also built for two – the max number of family members eating it tonight. Add your fave veg (carrots, parsnips and onions here, with a use it up handful of shredded Brussel sprouts here instead of new cabbage). We're skipping potatoes for Jewish rye :). Cover meat and seasonings with water, bring to boil, then simmer covered. Add veg after about an hour. Cook 2 1/2 to 3 for larger cuts. Cool completely before slicing. 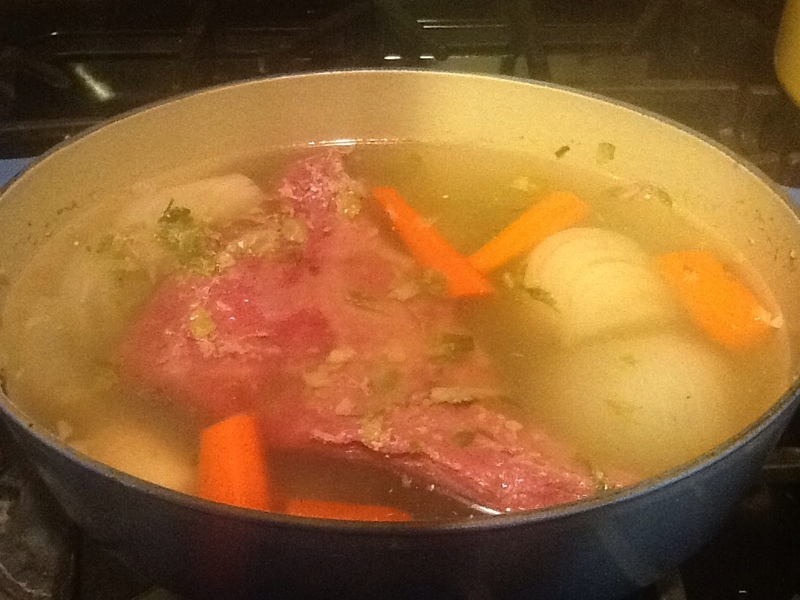 Mar17March 17, 2014 • By Betsy Karetnick • This entry was posted in corned beef, Dish of the Day, Kitchen Help, Recipes, St. Patrick's Day and tagged corned beef, Jewish rye bread, St. Patrick's Day. Bookmark the permalink.